Anna Spitzmüller was born on September 6, 1903, in the Moravian town of Znaim (now Znojmo, Czech Republic) as the daughter of an old Austro-Hungarian military family. 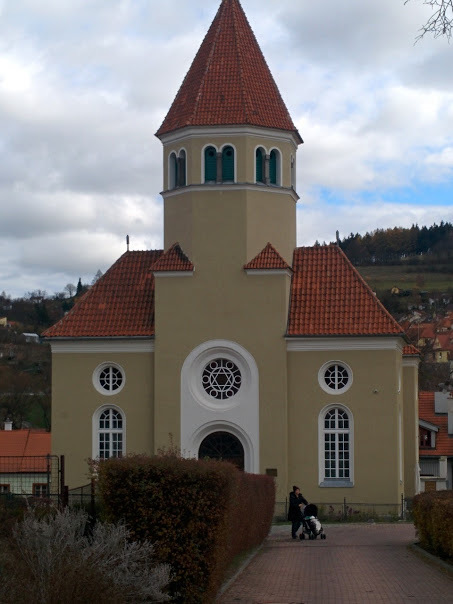 Her mother also came from aristocratic background, and her ancestral home still stands in Znojmo. Her father was Amadeo Spitzmüller von Tonalwehr (1871-1945), a high-ranking officer in the Imperial Army, and her ”beloved uncle” was Alexander Spitzmüller , Freiherr von und zu Spitzmüller-Harmersbach (1862-1953), a well-known economist and banker who was the last imperial finance minister for the Austro-Hungarian Empire. She had one brother, born in 1909, who died tragically in the 1930s. Her grandfather originally came from Bukovina, one of the furthest regions of Austro-Hungary, now divided between the Ukraine and Romania. She was, then, the privileged product of a far-flung multicultural state that encompassed at least 14 ethnicities and languages, and which prized elegant behavior, education and cultivation. As Lucia Gunz, a colleague at the Kunsthistorisches Museum, wrote in her obituary: ”Etwas von diesem Übernationalen der alten Monarchie, ein für alles kulturell Andersartige offenes Fluidum und wienerischer Charme gehörten zum besonderen Charisma von Anna Spitzmüller” (roughly translated: Something of this multicultural internationalism of the old monarchy, a fluidity between cultural differences and Viennese charm defined the special charisma of Anna Spitzmüller). As her father was stationed throughout the Empire, she spent her earliest years in Prague, then a while in Olmütz (now Olomouc, Czech Republic); she learned to speak Czech among her many other languages. Her father was then stationed permanently at the War Ministry in Vienna, and the family moved in 1913 to Windmühlgasse 13, where Spitzi would live for the rest of her life. She described her upbringing as ”completely free and open,” with ”sehr gesellige Verkehr”–lots of social life. Dinner conversations were learned and scholarly; her father was very educated, and her mother was very musical. She was privately tutored as a girl, and learned French and English from governesses. When the family moved to Windmühlgasse, she was able to attend the Rahlgasse Mädchengymnasium (see my blog entry for 24 November), the first school of higher education for girls in Vienna. She was educated by the first generation of women teachers, who, she said, were tremendously gifted; she received there an excellent educational grounding, to become one of the first Austrian women to attend university. The end of the monarchy after World War I was a difficult time for families so linked to the Imperial machinery that had governed their lives; Spitzi’s father, as a military officer, received very little pension from the new republican government, and suffered from ”nerve problems” until his death in 1945. Her mother died in 1938; I remember her telling me, in one of the only times she talked about her family, that when the Nazis entered Vienna, her mother simply gave up and died of a broken heart. In 1920, after attending and being impressed by an exhibition of tapestries at the Belvedere, Anna announced to her astonished family that she wanted to study art history and to become an art historian. She enrolled at the University of Vienna in 1921, as a student of the renowned Josef Stryzgowski (1862-1941), controversial antagonist of the so-called Vienna School of Art History led by Max Dvořák (1874-1921) and Julius Schlosser (1866-1938). Peter Strudel’s altarpiece, Rochuskirche, Vienna, 1690. Her first project after finishing her degree took her to Kärnten–Carinthia, the southernmost province of present-day Austria. Here she was to make an inventory of the major monuments of the region for the famous Dehio Handbuch der deutschen Kunstdenkmäler Österreichs. (The Kunsthistorisches Institut first published her findings in 1929 as a separate volume, Die Kunstdenkmäler des politischen Bezirkes Villach). In her Albertina interview, she talks about this experience as an important one for her personally: since there were very few cars or even busses there at this time, she had to travel between monuments by foot, and stayed at peasant houses overnight. This was her first exposure to these kind of country people and a simpler, uncultivated way of life. She was to be forever impressed and affected by these encounters with the working class and peasants–what she called ”echtes Leben,” real life. In the 1930s, she would travel by train in what was then a ”4. Klasse”, almost free and with wooden benches, because she liked to hear all the languages and dialects which she said were ”wie Chinesisch” to her. Back in Vienna in the fall of 1926, she first tried to find a position at the Nationalbibliothek. Then one day, walking across the Burggarten, she remembered a chance meeting years before with Otto Benesch (1896-1964), who had been at the Albertina since the mid-1920s. Erwin Dominik Johann Osen, Alfred Stix, 1947, Belvedere, Vienna. With Stix, she prepared the complete catalogue of the Albertina’s drawings (Beschreibender Katalog der Handzeichnungen in der graphischen Sammlung Albertina ), working on all six volumes, but especially responsible for volume 6, Die Schulen von Ferrara, Bologna, Parma u. Modena, d. Lombardei, Genuas, Neapels u. Siziliens–the Italian works. By the 1930s, she obtained a real civil service appointment at the Albertina, and loved her work there. She travelled to do research and to purchase art for the collection, met interesting and important people in many countries, and, most significantly, worked to make the Albertina’s collections more accessible to the public. She became good friends with the Keeper of Prints and Drawings at the British Museum Campbell Dodgson, and told amusing stories about being called to meet Princess Cecilie of Prussia (Spitzi had little truck with Germans in general, and said of the royal request, ”Es ist nicht meine Art mit Hoheit herumzugehen”–it’s not my style to pal around with Her Majesties). When Stix was appointed to the Kunsthistorisches Museum in 1934, her position at the Albertina became a more important one. She continued to organize exhibitions and to work on catalogues of the collections, as well as articles about individual drawings or sets of prints. And then the Nazis and the war came. In the video interviews with her at the Albertina, Spitzi seems a bit reluctant to talk about this period. This reluctance is understandable, since it is not a pleasant time to remember, and because those who want to see things in black and white–as good on one side and evil on the other–would perhaps cast her as a collaborator with the National Socialist regime, despite all evidence to the contrary. She did remain in Vienna and at work in the museums, while both Stix and Benesch were removed from their positions. Benesch, whose wife was of Jewish background, went to America, where he taught at Harvard and Princeton. Stix stayed in Vienna, and worked, apparently sub rosa, with Spitzmüller in the Albertina collections. Nazi directors were appointed at all the Viennese museums, but according to her memory, they were simply figureheads who had little impact on the running of the institutions. ”We continued our research, but couldn’t publish anything,” she recalled. (She did have some articles published during this period, both in the Jahrbuch der kunsthistorischen Sammlungen in Wien and in the more popularized and unfortunately named Kunst dem Volk.) In 1939, she had to get special permission from Berlin to attend an art history conference in London, where she was able to see many of her former Jewish colleagues who had been able to escape. Still, she returned to Vienna and to the Albertina, feeling obligated to stay in Austria. Her first task, once the Anschluss happened in 1938 and it was evident that war was imminent, was the secure storage of the priceless collections of the museum. (In the taped interview, she also talks of the removal of those works deemed by the Nazis as ”entartet”–degenerate–and their ultimate retrieval after the war.) Spitzmüller was chiefly responsible for bringing these objects to safety in the salt mines of the Salzkammergut; she was particularly dismayed that, despite the Albertina’s meticulous documentation of their holdings, the Americans after the war ignored these documents and took all the objects to Munich, where she, quite fortunately, had to go to sort through all of them. According to her statements on the interview tapes, objects belonging to Jewish families and collectors were also stored here in separate sections. After 1943, as the war dragged on and the Kunsthistorisches Museum closed, the Albertina continued to have in-house exhibitions. But the conditions became increasingly bleak, and finally, on March 13, 1945, an Allied bomb hit the Albertina itself. The Albertina’s cellar, which had been thought to be the most protected bomb shelter in the city, proved to be less than safe, and for the rest of the bombing campaigns of the war, the staff had to shelter in the Augustinerkirche, which Spitzi described as ”extremely unpleasant.” At the end of the war, Vienna was in shambles, and the people were part of a defeated nation. With Cott, Spitzmüller went to Munich to retrieve the paintings and graphic art that had been stored before the war. At that time, she was able to see where many of the Jewish artworks confiscated by the Nazis had been hidden and were retrieved. The Americans brought the artworks back to Vienna by boat, and Spitzi and her crew unloaded these treasures. They were housed with other retrieved artworks on the Hohe Warte until the Albertina’s building could be rebuilt. During the war, she had also met with Otto Benesch’s family and through his father Heinrich, an important art dealer and friend of Schiele, had secured for the Albertina the Roessler collection of Schiele’s graphic art. She had not been idle during these dark years, and was prepared to continue energetically as soon as the war ended. In retrieving more hidden artworks in Zwettl, she saw storks again, which she took as a good sign. During the occupation of Austria by the four allied powers, Spitzi spent much time in the French zone, organizing exhibitions and finally travelling to France to reestablish contacts with the art world there. As early as 1946, she was able to mount a cooperative exhibition with the French, highlighting artworks in the Albertina’s vast holdings. Her little catalogue of the show, Französische Phantastik, was one of the first art publications produced in Vienna after the war. Upon returning to Vienna, Spitzi left the Albertina to move to the Kunsthistorisches Museum. When asked why this change occurred, she admitted that the circumstances with Benesch had become too difficult to continue there. His ego was such that, despite being immensely talented, he simply could not bear working with a woman as an equal. At the Kunsthistorisches, she took over the Führungsabteilung–essentially the Public Programs Department–and worked energetically to open up the Museum to the public, to encourage school visits, and to sponsor symposiums and lecture series. She worked at the Museum until her mandatory retirement age forced her to retire in 1969. When she retired, she was given the title of ”Hofrat” and made an Honorary Member of the Österreichischen Kunsthistorikerband, and in January 1970, she received the Chevalier ribbon of France’s Ordre des Arts et des Lettres. Someone as dynamic and vivacious as Spitzi, of course, did not fade into a German-style Ruhestand. She had been teaching American groups of students through the Austro-Amerika Institut since the 1930s, and as soon as World War II ended, she appeared in its offices to offer her services again. She established a long-standing relationship with Hope College in Michigan, which brought groups of students to Vienna for a summer school from 1950. She admired the fact that American students would be open enough to admit that they didn’t understand something, and she found that teaching them was immensely enjoyable. She continued teaching groups of students, like my Junior Year Abroad group from Temple Buell College (Colorado Women’s College), well into the 1980s. In 1987, Hope College honored her and paid tribute to her services to the College, in conjunction with an exhibition of Viennese art at the school’s Art Center. At this time, I was able to give a lecture with her in attendance, and thank her for her 50 years of teaching American students. Spitzi being feted at Hope College, Holland, Michigan, October 1987. Spitzi on the video, being interviewed at 90, 1993. In 1993, the Albertina, as part of a video history of the institution, interviewed her with special focus on her time there. She was then 90 years old. Her recall was still great, although she was by this time a bit impatient about answering some questions. I found it particularly interesting to hear her answer when the young woman interviewing her asked her to comment about the role of women in the cultural life of the country. This incredibly cultivated woman who had had to fight patriarchal systems all her life, who confronted hide-bound misogyny and sexist barriers throughout her career, and had been a founder of ZONTA, the Austrian academic women’s organization–she would have none of the feminist stance of subjection or submission or discrimination. Her response was to say that women probably had a better feeling for ”das Zeichnerisch”, the quality of drawing! As reported in a moving tribute to her by a former colleague at the Museum, Anna Spitzmüller died on September 25, 2001, a few weeks after her 98th birthday, ”cared for at the Heim der Kaufmannschaft in the XIX.District” of her beloved Vienna. Finally, my own opinion: that this woman of distinction, of intellect and accomplishment does not appear in any dictionaries or encyclopedias of art historians, that photos of her military relatives abound while none of her can be found in any archives, and that I have only been able to find two obituaries for her in professional publications certainly signifies a level of neglect that can only be a result of her gender. Some of this invisibility may be attributed to her own modest character, but I want to see the work of women like her heralded as much as their male colleagues have been. Soon Anna Spitzmüller will at least have a Wikipedia page! [*This post was written by Erika Esau who states that it is CC-BY-SA, a form of open source, free-use, copyright waived bit of intellectual property. HAPPY HOLIDAYS FROM GEORGE & ERIKA!!! As most of you already know, George and I are now in the first months of our 9-month European adventure, and are having a grand time (that’s a photo of us taken in Vienna’s Konzerthaus, just before seeing Valery Gergiev and the London Symphony). It has been an action-packed year to be sure, so I will try to summarize. We started thinking about the possibility of a long trip around Christmas time last year. George had decided he would retire in July of this year, on the stroke of turning 66. Part of our thinking was based on the fact that with retirement income, we really can’t afford to stay in our Pasadena house, and realized that if we could rent out our house and call in all our karma of 40 years of visitors and dear friends, we could actually live much more cheaply abroad. So why not take the trip of a lifetime while we are still relatively ambulatory? And that’s what we did: we found a great person to rent the house for 9 months, through our Austrian connections (thanks, Wolfgang!) managed to arrange a visa so we could stay in Europe longer than 90 days, found cheap rentals of nice places through online sites and through the wonderful generosity of friends (thanks, Henry & Val, Edith & Hans, Wolfgang & Nora, and Evy!) and cashed in as many extra funds as we could. Now we’re off! We have already been in London and Berlin, and now are spending several months in our favorite place, Vienna. In January we will begin a month each in Lisbon, Barcelona, Athens, Dubrovnik, and Trieste, before heading back to Vienna, then Germany, and home via Toronto! As for the rest of our year: in February, G. got hit by a car while riding his bike–a nasty mess, but thankfully, he was not badly injured. But it did make us more committed to the idea of going on this trip! It took a while to heal, and to get insurance to pay, but in the end, we are so grateful for a good outcome. And in July, George did retire, after 45 years of a peripatetic working life! He seems to be perfectly happy with retirement mode, although so far we’ve either been preparing for a trip or travelling; we’ll see how he feels when we get back to a boring routine, if that ever happens. And in other happy and enormous news: Max, as one of the only people in the entire country to get a real tenurable position, was appointed as Assistant Professor in Biology (Genomics) at Regis University in Denver! So our lives have come full circle: Denver is where George and I met (in library school)! G’s father and brother still live in Greeley, Colorado, so this all seems a fortuitous development. And their good news doesn’t stop there: in July, for George’s birthday, Max & Dottie sent us ‘’gifts’’ which announced in a very sweet way that they were expecting our first grandchild in January! We are so happy with this news, even though we won’t be there for the birth. BUT due to our own flippant responses to an earlier question from Max– ‘’if you have a kid, we would move to Denver’’–we are kind of obligated to do just that when we return to the States. So lots more changes in store for all of us! I hope that most of you know that 1) I’m a Facebook addict and put up gillions of shares and photos on that site; and 2) we have a blog that we are adding to quite regularly on this trip, so please check it out: https://esauboeck.wordpress.com/. I also put up occasional mini-videos on YouTube, so check that out, too! Again, I want to express our love and gratitude to all of those people who have helped us fulfill this dream–including George’s beautiful cousin Shelly Powell, who died of cancer on December 26, 2014. This was devastating to all of us, and we miss her still. To our total amazement, she remembered us in her will, a completely unexpected gesture that has helped immensely to make our adventure possible. And to all of you who wonder if you could do the same, we say: YES, JUST DO IT! Just a little observation and query. Yesterday, on our street corner, where the elegant piano maker’s shop is, I saw their delivery boy–a blonde, blue-eyed young Austrian–wearing this hoodie. I am just fascinated by this. What on earth does this signify to him? He may be from a poorer, less educated family, maybe some drinking and/or abuse, but he is in no way disenfranchised, he’s working, he seemed to be communicating quite well with the workers in the shop. I just want to know what this emblem of American black street culture signifies for him, and other young white Europeans who I have seen wearing similar gear. What is its fascination for them? Danger? The buzz of violence? Derring do? Rebellion in general? When at MAK the other day, we went into its very hip gift/bookshop, where I found this book offering walks through Vienna focussing on women in the city’s history. Written by an ”academic feminist,” the informative and quite readable stories are written in an anecdotal style and lead you through different parts of the city to experience sites of important moments for Viennese women. Since our neighborhood figured in several of these stories, I decided to go take a walk in some fascinating, if at times predictably sad, footsteps. Rahlgasse from the steps down from Mariahilfestrasse. The entryway to the Rahlgasse Mädchenschule. a coeducational progressive high school, but which began as the first gymnasium for girls in Vienna–and this only happened in 1892, after years of struggle to allow advanced education for women. (A Gymnasium in German is an advanced high school, like a college in Australia.) Until this time, women had to be taught at home, and were of course not admitted to the university. Marianne Hainisch (1839-1936) began to work toward this goal in the 1870s, against fierce opposition from men in authority. Maria Hainisch (1839-1936), founder of the Mädchenschule and activist for women’s rights. A plaque in her honor appears on the school’s facade. Just think of the amazing number of incredibly brilliant women who taught here, and those who began their careers here! In her video interviews that I have just listened to at the Albertina, my art history professor Anna Spitzmüller recounts that her parents moved to this side of Vienna in 1913 because of the educational opportunities provided here. This must have been the school that she was referring to, since she lived very near by, on Windmühlgasse. The other plaque shown here honors another of the school’s brilliant graduates, Gertrud Herzog-Hauser (1894-1953). Gertrud Herzog-Hauser (1894-1953), in a painting by her husband Carry Hauser. While her real passion was for classical philology and philosophy, no possibility of an academic appointment for a woman existed, and so Herzog-Hauser became an influential teacher of girls, as well as a writer of textbooks for the school curriculum. In 1937 she was named director of the Rahlgasse Gymnasium, only to be kicked out the next year when the National Socialists came to power. Although a convert to Christianity–she was also married to the Expressionist painter Carry Hauser–she was forced to flee Austria as a Jew. Their 4-year-old son was shipped to England as part of the Kindertransport, while she managed to live through the war in Holland. She returned to Vienna after the war, but still experienced anti-Semitism and was never able to re-establish a career. She died at only 59, in 1953. The other plaque on the side of the school honors yet another graduate and another story of struggle for recognition despite formidable achievements, that of Marietta Blau (1894-1970). As the plaque states, Blau was a physicist, ”a groundbreaking researcher in the development of photographic methods of particle theory. Her techniques led to the discovery of nuclear ‘stars.”’ Despite her tremendous contributions to nuclear research, Blau suffered the same fate as Herzog-Hauser; the plaque ends with those stark words, ”Blau was forced to leave Austria in 1938.” She, too, returned to Vienna after the war, but despite some belated recognition, was never able to be appointed to an academic post, and died in penury. A very sad period for women, for Jews, for humanity, indeed. Turning around and back up the stairs to Mariahilfestrasse, women’s stories continue at the other end of the cultural spectrum, in the world of fashion and theater. On the corner at the top of the stairs one finds the building still called Casa Piccola. In the 19th century and into the early 1900s, the building was the site of a beloved cafe, frequented by the more bohemian figures of Viennese literary and artistic life. The owner of the cafe at this time was Karl Obertimpfler, whose daughter Lina, a famous beauty, became the architect Adolf Loos’s first wife. Lina Loos (1882-1950). She wrote witty and pointed commentaries about women and the men who love them. After a disastrous scandal leading to her lover’s suicide, Lina Loos left Adolf, fled Vienna and became a well-known actress and writer, both in the U.S. and then back in Europe, and finally in Sievering in Vienna’s 19th district. As the plaque on the side of the Casa Piccola describes her, she was always open to ”the new”. I think today she would have been a famous hippie beauty or a movie star. And the other woman on the Casa Piccola plaque is one better known to some of us: it was in this building that Emilie Flöge (1874-1952), along with her sisters, had their famous Modesalon, designed by Koloman Moser and Josef Hoffmann as the epitome of the Secession era’s artistic and fashion reform movement. Emilie Flöge (1874-1952), ca. 1904. Flöge, of course, is more famous as the ”life partner”–the main squeeze, the muse–of Gustav Klimt, for whom she designed his flowing robes and for whom she posed for some of his most famous and sensuous paintings, but she was an influential designer and artist in her own right. Gustav Klimt, Emilie Flöge, 1904. Klimt died in the flu epidemic of 1918; Flöge ran her shop in the Casa Piccola until the Depression and then the Anschluss forced her mostly Jewish clientele to flee. She lived until 1952, but as Petra Unger writes in Frauenspaziergänge, her last years were spent in obscurity. She never wrote about her years as Klimt’s muse. Finally, my own thoughts on the subject of women in Vienna: I think it is telling of the inequalities that women in the 20th century have had to endure that in my research on Anna Spitzmüller–the first woman curator in Austria, a decorated scholar, a participant in the events that have made the ”Monuments Men” so famous–I have found no photos of her in any Viennese collections or archives, and only a very few notices on her death, while photos and notices of her father and her uncle–and of many far less influential men–abound. Only my own observations, but there does seem to still be tremendous gaps in the recognition of women’s accomplishments and their part in the cultural history of this city. But I’m very happy to find this book; I’m going to take the other walks described here, to find out more about these women who made their mark, and whom I am just getting to know. Given the tragedies in Paris and the continuing, simmering chaos of the refugees streaming into Europe, I thought it was about time I write about events that I have been meaning to write about for a month, and just haven’t had the energy to complete. We arrived in Vienna on the first of October. After a tip from our friend Edith, we learned that a major demonstration in support of the refugees and expressing Austria’s desire to welcome them was planned for the next weekend along the Ringstrasse, ending in the Heldenplatz with a concert sponsored by the national television, ORF. Being about three blocks from our apartment, we walked down there to check it out. 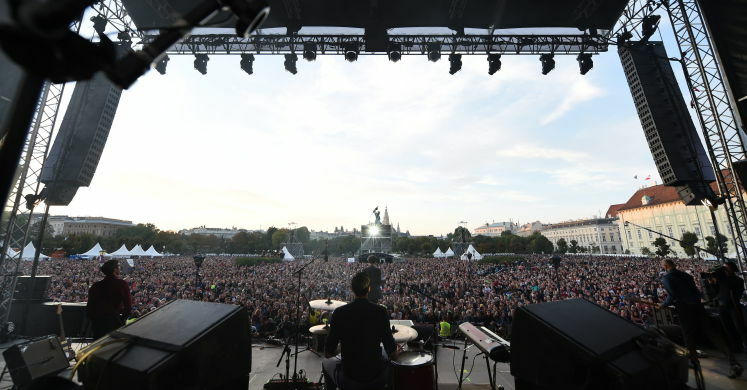 We got there just as the first of the marchers arrived at the corner of the museum buildings–the march was to end at the Parliament Building, then have people filter into the Heldenplatz, where the concert would take place. We were amazed. We stood there for an hour and a half, and people kept coming. Some were part of organized groups–from evangelical Lutherans to Greens to Communists–but many were just ordinary Viennese, wanting to express their hope that the tide of refugees would be treated humanely and with respect for human rights. The marchers had trekked some 45 minutes, walking down Mariahilfestrasse, the main shopping street, that had been covered in smiling images of migrants’ faces, of all nationalities and colors. A large part of this enormous turnout–it must have been over 100,000 people–was prompted by concerns about the rise of a right-wing, anti-immigrant candidate for Vienna’s mayoral race, the vote for which was scheduled for the next week. Heinz-Christian Strache’s Freedom Party had been gaining ground among Austrian blue-collar and rural voters with a campaign of fear and xenophobia, claiming that Austria would be overrun by Muslims and foreigners. If elected, Strache–who was a dental technician–would, of course, have cut funding for the usual right-wing suspects: education, health, women’s rights, and culture. He would also have attempted to thwart the humanitarian efforts to aid the influx of refugees that were already taking place in the city. 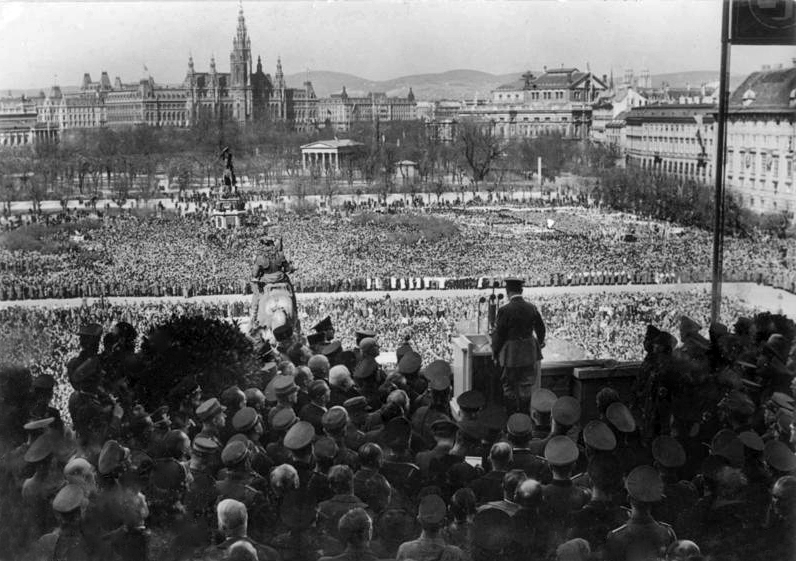 In the end, the Freedom Party did not win, but they did gain seats–this in a Vienna that has had a Socialist mayor since the end of World War II. The incumbent Socialist mayor won. The refugee crisis is a complex issue, and it will be very difficult to handle sanely and compassionately. But we were heartened to see that, at least on some barely recognized level, Austria is aware that the path of hatred and nationalism has been taken before, and it must be avoided at all costs now. 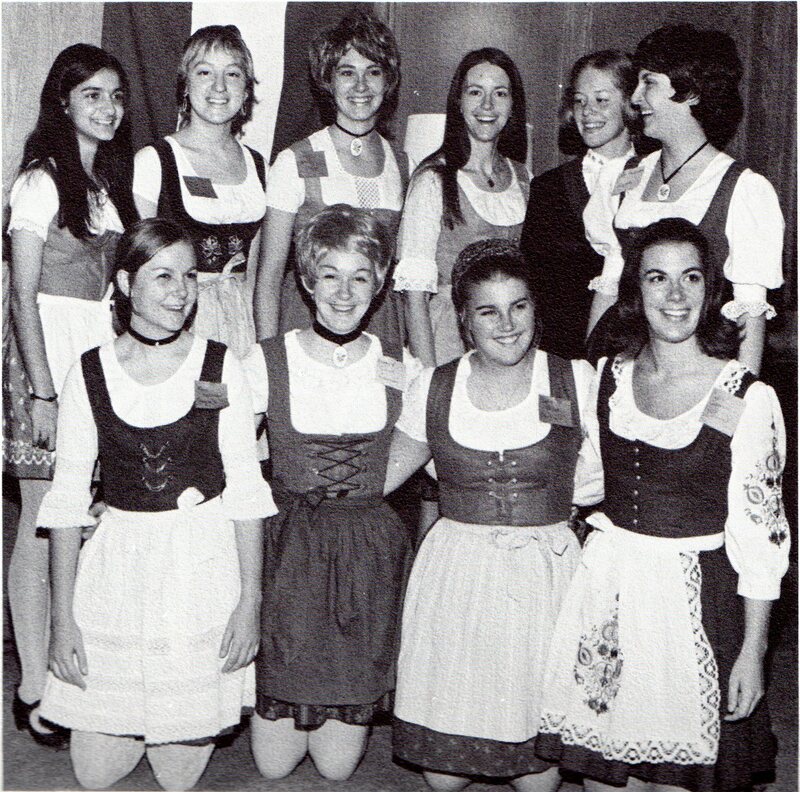 We were a group of about 16 who went to Vienna for our Junior Year Abroad in 1969. Some of us were German majors, and we all had at least a bit of German study already, since all of our classes were to be conducted in German–or were supposed to be. But many of us were also interested in art history, so we were looking forward to visiting the legendary museums of the Habsburgs and examining the buildings and sculptures of the city. Only later were we to realize how unbelievably fortunate we were to encounter from the very beginning the most inspiring art historian that Vienna could have offered to a group of callow young women from America. Anna von Spitzmüller had, it turns out, been teaching groups of Americans at the Austro-Amerika Institute since 1930. Everyone called her ”Spitzi”. We met her the first night we arrived in Vienna, just as we met the families with whom we would be living that year. She then accompanied us on a tour through Austria, during which she told us about all the monuments we were seeing, including, as I remember, one of the Carolingians’ thrones. She had amazing recall, spoke perfect English (and despite the mandate that our classes be in German, she often spoke to us in English instead, since she wanted us to understand the art), and was the most marvelous and charming guide one could ask for. On this trip, we went as far as Kärnten (Carinthia), which she particularly loved, since (as we learned later) she had actually traversed the province on foot in the 1920s as a young scholar to document the architectural monuments for the Dehio series of guides. As we rode through the Austrian countryside and mountains on a tour bus, she regaled us with anecdotes and stories, sang songs, and was always concerned about our well being. I remember that as we entered into the Carinthian Valley in the middle of the Alps, my roommate and I suffered terrible headaches–the only time I ever had a migraine–which Spitzi explained was because of the famous Föhn winds; all Austrians believe that the Föhn can lead to all kinds of ailments and explosive behavior. She wrapped us in scarves and let us have dinner brought to our rooms. Portrait of Hélène Fourment (Het Pelsken), c. 1638 Kunsthistorisches Museum, Vienna. Nearly every day of classes we went to a museum or a monastery or walked around the city and looked at buildings. I don’t recall her giving a single lecture with slides in a classroom. She had been the first woman curator at the Albertina in the late 1920s, and then was at the Kunsthistorisches Museum from the 1950s until she retired–in the year she was teaching our group. She took us to the Kunsthistorisches Museum at least once a week, and would focus on one room or one painting or one collection each time. I can still see her standing in front of Rubens’ Portrait of Helene Fourment, and saying that she looked like she had just stepped out of the bath ”to her husband’s pleasure”, and we all blushed. 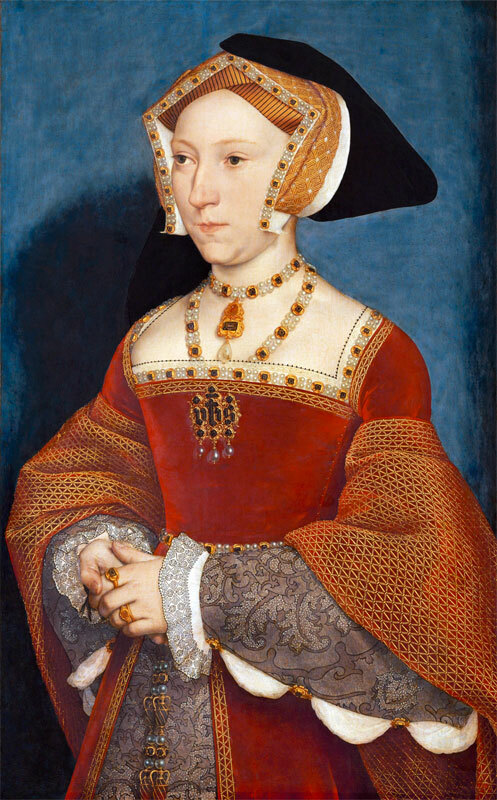 She also knew everything about the history of the works in the Museum, and recounted how exciting it was when the conservationists cleaned Holbein’s Jane Seymour and they saw for the first time that she had a black headdress, and that the background was blue. ”It took a long time for this painting to speak to me, but she does now,” she said, and we silly little girls from the Midwest and California thought she was a little daft. When she noticed our attention flagging, she would say ”Time for Apfelstrudel!”, and we would go to the cafe for treats. When we took excursions to old churches and monasteries, still not heated and most of them chillingly cold, she would bring a whole suitcase of sweaters for us mini-skirted ones, so that we wouldn’t be uncomfortable. If we were on extended Ausflüge, she would bring along her beloved dog Asi, and when we had stopped for coffee, she would often fall asleep–very briefly–into her Schlag, and then wake up and continue talking as if nothing had happened. After a few weeks of visits to the museums, she began to walk us around her beloved city (she still referred to Prince Eugene of Savoy, the hero of the battle against the Turks in 1683, as ”our beloved Prince Eugene”), and would explain the architectural history of every building. Soon she would ask us, ”so what is it?”, meaning who built it and when. When we would blink unknowingly, she would explain that the building was a Renaissance structure with a Baroque facade, and she would tell us how we could know that from the features that we could see. This analysis was the very best training a budding art historian could have received. A sculpture of Prince Eugene of Savoy, in his palace, the Belvedere. We had never met anyone like her. She was obviously the daughter of the Austro-Hungarian Empire and of privilege–two categories about which we suburban girls only had the vaguest concept. We admired her incredible Baroque garnet earrings and brooches, which, she told us, were inherited from her grandmother or mother. As American girls just trying to figure out in German when to use the formal Sie and the informal Du in addressing people, we were shocked when she talked to one of the Institute’s secretaries, a much younger, mousier woman who used Du with Frau Dr. Spitzmüller! We then learned that both Spitzi and the secretary were of the aristocracy, and so would have been allowed such usage by tradition. This fascinated us tremendously. She knew everybody and everything about Viennese art and its collections, and we only later realized how unbelievably privileged we had been in getting to meet such important cultural figures and to have experiences that only Spitzi could have arranged. She once managed to have for us a display of many of the Kunsthistorische Museum’s amazing Rudolphine gadgets–all the clockworks and mechanisms made out of precious jewels and with intricate cogworks made for Rudolph II of Prague in the 16th century. I can still see them, ticking across the floor of the Kunstkammer, tingling and chiming and twirling away! Spitzi took us to meet a real princess–a British woman who had married a Habsburg (or was it a Liechtenstein?) who lived in a Renaissance Palais and served us tea in Biedermeier cups (we were terrified we were going to break them). And 1969 and 1970 saw one of the first ”rediscoveries” of Klimt and Schiele, over which we all swooned–and so Spitzi took us to meet Christian Nebehay, the son of Klimt’s dealer who still owned and sold in his gallery the major works available by both artists. She was also a great pianist herself, and knew the musical world very well; she took us to the home of the principal violinist of the Wiener Philharmoniker, who had a substantial collection of manuscripts and modern prints as well. And then there was her apartment, on the Windmühlgasse, where she had lived since 1913. She invited us to visit there because–to our complete amazement–on her living room walls were major works of art by Schiele, Toulouse-Lautrec, and lesser known but just as wonderful artists such as Ludwig Jungnickel. Most of us had never been in a home that had REAL art on the walls, by artists whose names we knew! Ludwig Jungnickel, Study for Paradies der Tiere freize, Palais Stoclet, 1903. This may be the very drawing that Spitzi had in her apartment. After our semester ended in May, I stayed on in Vienna through the summer, and continued to see Spitzi; I was now certain that I wanted to be an art historian, and I wanted to take advantage of my time in the city for as long as I could. Spitzi was so helpful, or at least I think it was because of her status that I, a lowly undergraduate, was allowed to sit in the Albertina Studiensaal and ask the attendants to bring me whatever I wanted to see. They obliged: I held in my hands one of Dürer’s woodblocks, and I looked at all of the drawings and watercolors of Schiele (which, I later learned, had been brought into the collection through Spitzi’s efforts). In all the years since, I have never had such free-rein access to such masterpieces in any collection. It could have been the times, before institutions became strict about such things, but I really do think that being her student played an important part in allowing me such privileges. When I came back to Vienna with George in 1980 to complete my dissertation research, Spitzi was still there, still teaching students at the Institut. She would invite us over to her apartment–the same apartment, needless to say–with all those artworks still on the walls; we would have endless cups of tea, and broken pieces of Manner-Schnitten that she bought at the day-old shop. She was as open and friendly to George as she was to me. And when a few years later I had my first art history position at Lawrence University and had contributed to an exhibition on Viennese art that came to Hope College (one of the colleges that came to the Austro-Amerika Institut every year), I was asked to give a lecture in her honor at the college. Spitzi was there–Hope had always been her favored school–and I was able to thank her for inspiring me and so many other students over 50 years of interaction with bright-eyed, baby-squirrel Americans. The exhibition that opened at Hope College in 1987. That’s a Romako on the cover. That was the last time I saw her. When I decided to write about the German-speaking women who have had an impact on my life, Frau Dr. Anna von Spitzmüller was at the top of the list. Now that I am in Vienna again, I have been able to do some research into her life. The next installment will include more about her extraordinary life. These are just my reminiscences of a remarkable woman. 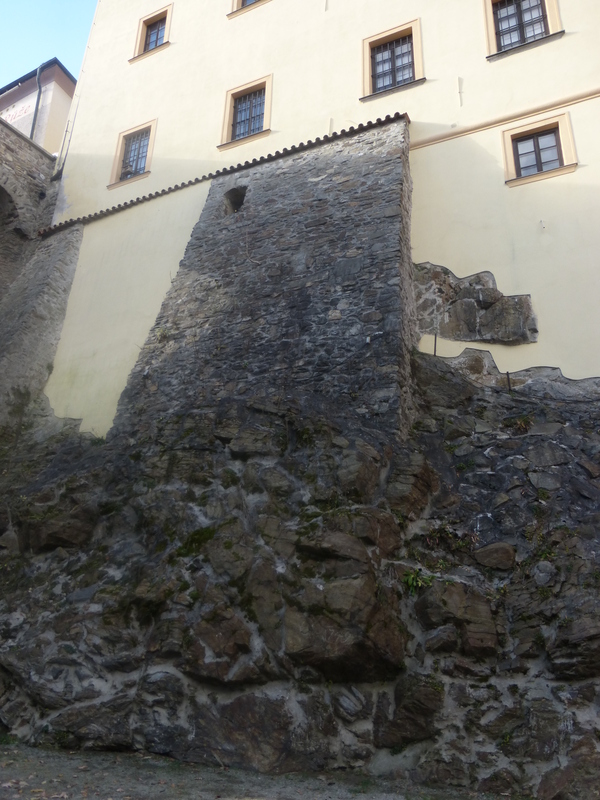 One of the walls of a building in the town, built directly out of the rocks along the River Vlatava. 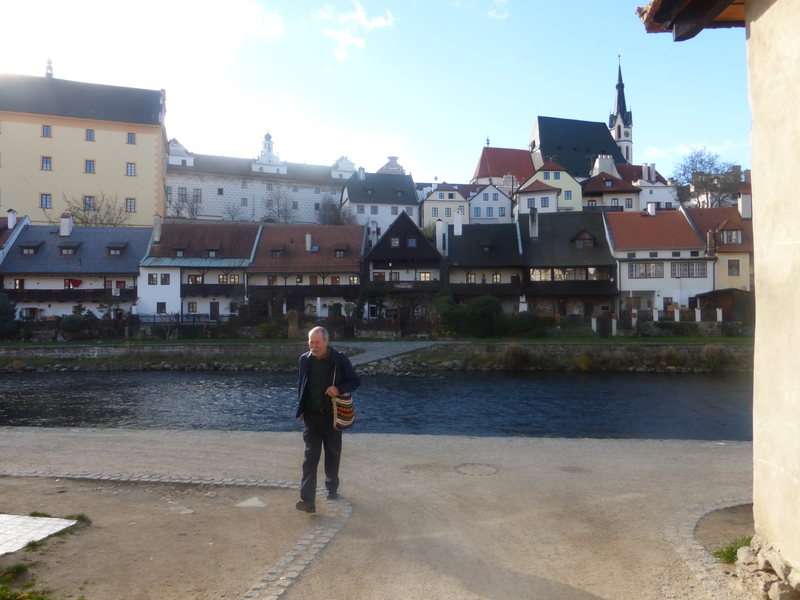 “I would hate to appear to be working for the Czech tourist board, but the pleasures of Český Krumlov really are almost too great. It is still not really part of anyone’s consciousness even though it has been easy to visit since 1989. The whole area of southern Bohemia was thinly settled and mainly German-speaking – Egon Schiele’s mother came from the town and he lived there for a time, creating some of his most wonderful pictures. Egon Schiele, Houses with Drying Laundry, 1911. I can only say to Winder’s comments, ”YES!” Český Krumlov is beyond picturesque, a nearly perfectly preserved medieval town that, despite being discovered by the tour busses, is not overly kitschy, and still feels like a real, authentic, lived-in place, albeit full of medieval and Renaissance buildings and shops for touristy things. After reading so many accounts of the place, and having it recommended by my Czech experts, we decided that, given this unseasonably warm late-autumn weather, we would rent a car and go visit. 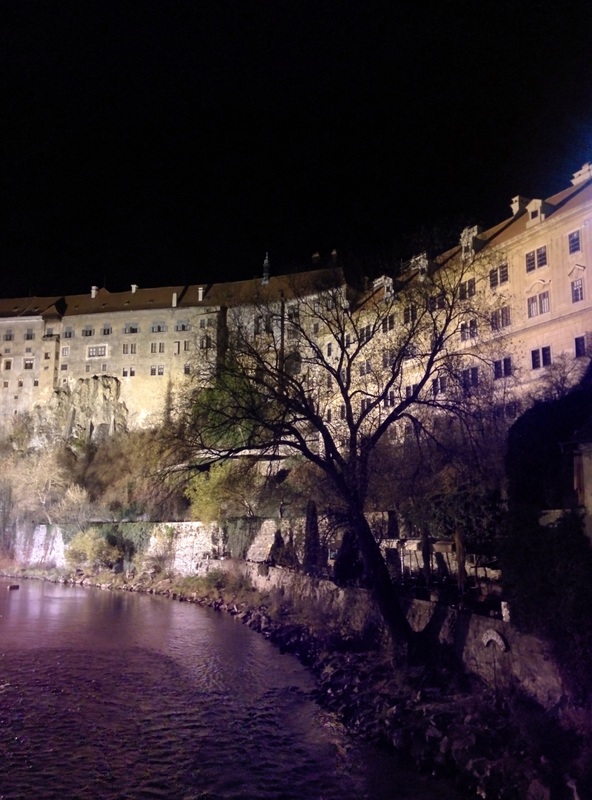 Oddly enough, there is no train service to Český Krumlov from Vienna, only tour busses. I wanted to drive through the countryside in any case, and the town is only three hours from Vienna, so driving was the best possibility. We almost cancelled because I was under the weather, but I’m glad we decided to go. The whole trip, with one night in a nice pension in the Latran and the car rental for two days, cost us less than $200. According to my tour guide of the town, this green house was the home of the castle governor in 1573-1588, and in the early 20th century was occupied by Fink’s Cafe, where Egon Schiele hung out. Because it is already getting dark here by about 4:30, the sun was just disappearing as we entered the old town. This was the view from our attic room in the Pension Faber. Romantic, eh? The hotel, run by a very young couple who looked like they could have come from Iowa, was completely deserted. Once the nice young man checked us in, he left the building, so we were the only people in the entire place! Because we had rented the cheapest room (for $45! 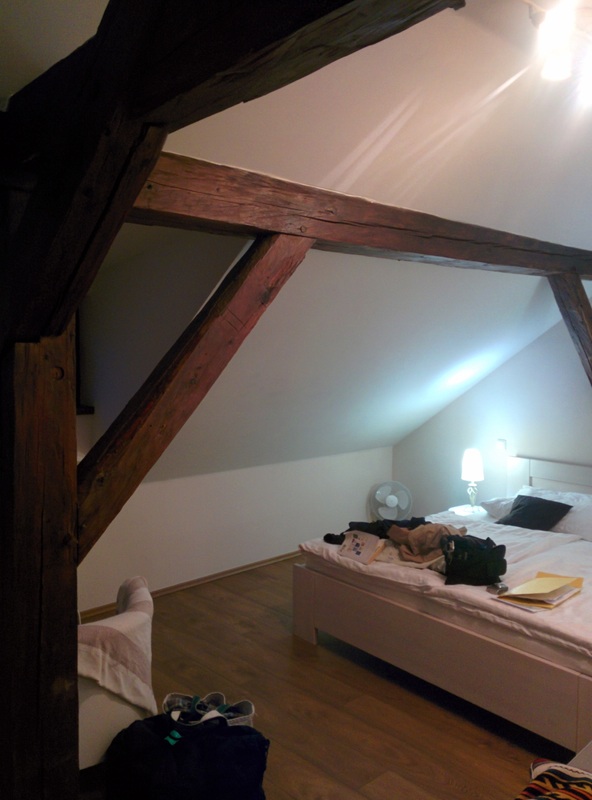 ), we were up on the second floor in an attic room that had 400-year-old beams and a slanted roof so we kept hitting our heads on the ceiling when we stood up from bed. Like every hotel in Europe, the blankets were feather beds, which were in the weather we are having now, decidedly too warm, so we ended up taking the sheets off the featherbeds, and using them as our covers! Now on to the wonderful houses and streets of Český Krumlov. This house above, with its amazingly painted facade, was directly across the street from our pension, and the first one we saw when we went out onto the street. 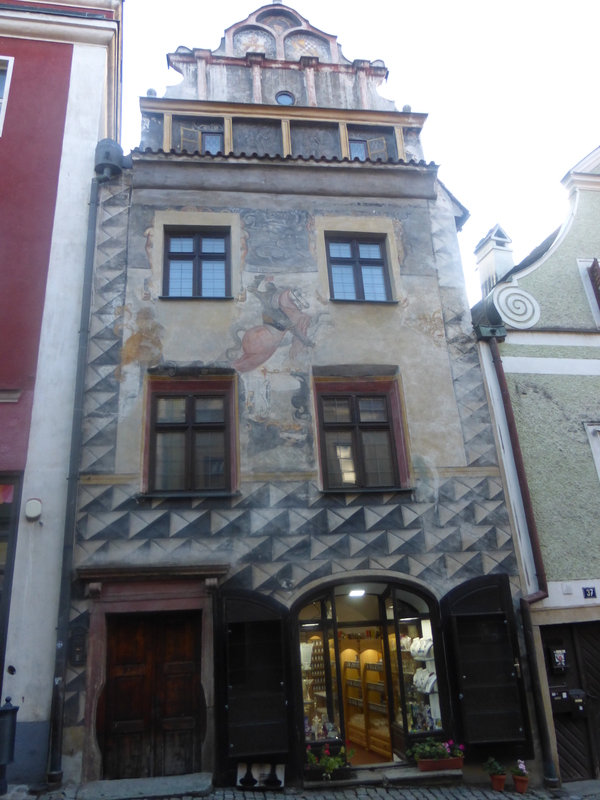 A Gothic house, it was rebuilt in the mid-16th century.When occupied by a rope maker in 1580 who wanted to impress the town’s rulers the Rosenbergs, the facade was painted with the Rosenberg coat-of-arms at the top and the ”Rosenberg Rider” in the middle. Covered in the 18th century with a Baroque facade, these frescoes were only uncovered during restoration in 1981. A Renaissance house with several layers of fresco votive paintings uncovered during restorations. The town is filled with such early gems, many of them covered in frescoes or old sgraffito designs from the 16th century. This gray building, which I originally thought must be a modern interpretation, is described in the tour guide as one of the rare remaining sgraffiti figural paintings, done by visiting Italian artists in the late 16th century. The most amazing, and in some ways overwhelming, aspect of the town is the Castle structure, looming well above the place on a cliff high over the river. We first saw it at night, beautifully illuminated for full effect. In the morning, George got up and wandered before I was awake, and came back overwhelmed with discoveries. So we retraced his steps, going down every little alleyway, until we came to the first riverbank of the Vlatava; the town is constructed on the islands in the horseshoe curve of this river. And there they were: Egon Schiele’s houses! 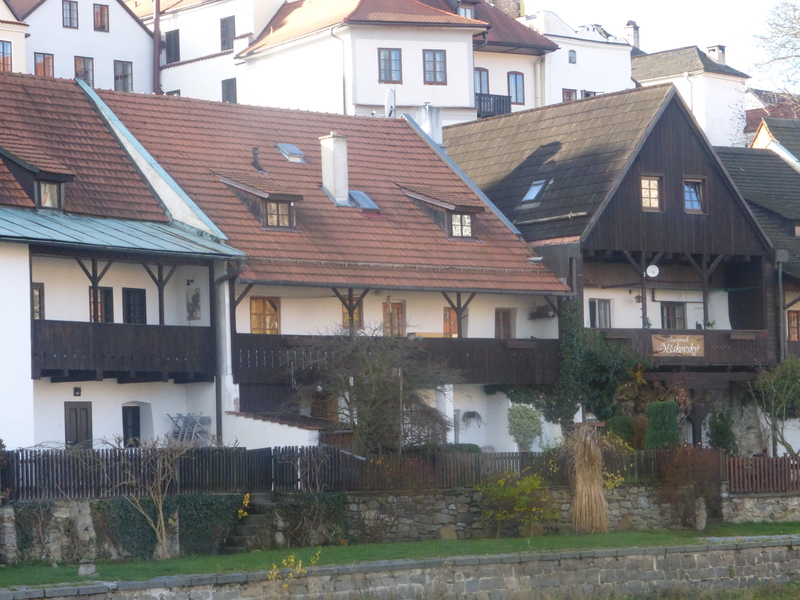 This section of town on the other side of the river is called Parkán, still inhabited, and still showing laundry hanging on the balconies. The river is also quite luscious, and you can walk along it at several points throughout the town. We then walked across the bridge of this curve of the Vlatava, to the town’s main square, again visiting all the little streets and alleys, finding artistś studios, and restaurants in old buildings, including this one, called ”U dwau Maryi,” or The Two Maries, which is located in a wonderfully restored 17th-century house, and is dedicated to traditional Bohemian cooking. The menu even included a history of Czech cookery, presented in 4 languages! It was warm enough that we could sit out on the patio, which is right on the river. Magical! This was, however, the only place where we encountered busloads of tourists–in this case, Japanese women, who were most interested in using the tiny old bathroom to brush their teeth! I’m so glad we were able to visit in the off-season, when so few people were on the narrow cobblestoned streets. At night, it was wonderful to walk and have the streets entirely to ourselves. I expected at times to hear a town crier walk by to tell us the town gates were closing. Wonderful old instruments and great musicians. We also managed to go to the Egon Schiele Art Centrum, which I expected to be a tourist trap, but which turned out to be a serious little museum, with exhibitions devoted to Czech and local artists of Schiele’s period. One of the displays was of the photographs of Josef and Frantisek Seidel, who had a photo studio in Český Krumlov for some 40 years. 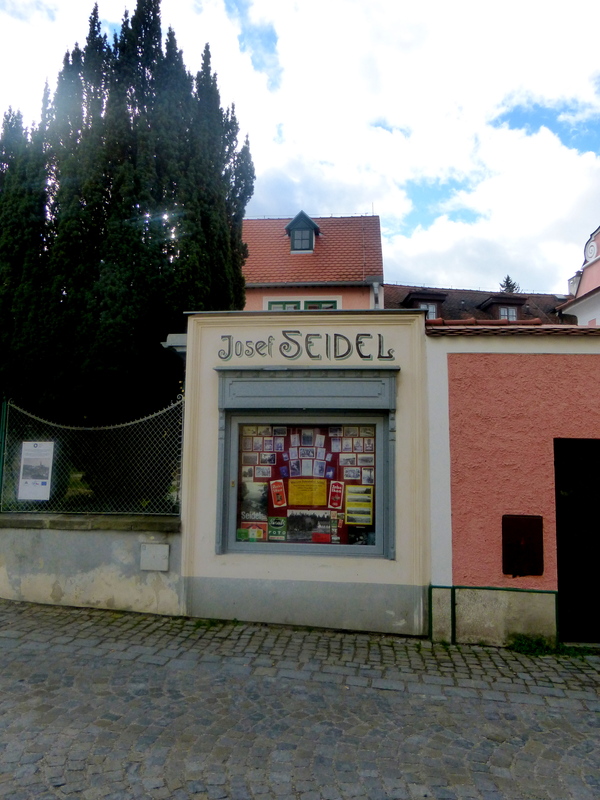 We then walked over to Seidel’s original studio, now a museum of his work. This street in turn led us up to the newly restored synagogue, one of the only Jewish buildings to survive the Nazi occupation. The plaque on the side of the building reads, in Czech: ”Here is where our fellow believers who were martyred under the Nazi occupation, called out to God.” I have just read that although it has a cafe and authentic interiors, it is now run by the Egon Schiele Art Center, and will be used to have exhibits about Jewish life in Central Europe. 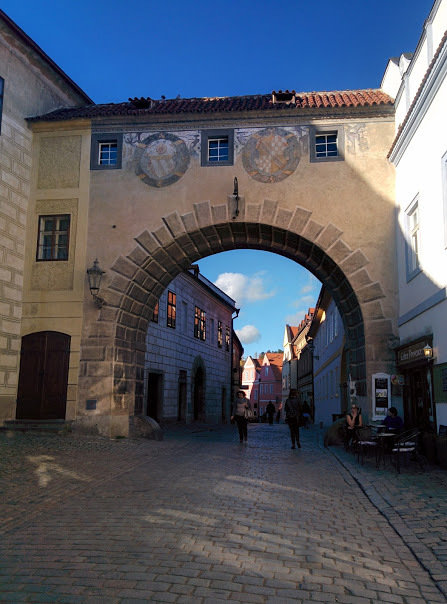 This means, of course, that there is not a minyan in Český Krumlov. At this stage, while taking a photo of jack o’ lanterns in the window of a preschool, as evidence of the spread of American culture even in the Czech countryside, I fell backwards on a cobblestone and smashed myself and the camera to the ground. We have, surprisingly, both survived relatively unscathed, but we decided then that we might give up the glories of this cozily majestic town and its cobblestones and head back to Vienna. We drove on small country roads through little Czech villages until we came to the Austrian border, where we joined a larger highway, and got back to Vienna just in time to hit a major Stau–a traffic jam–into the city. 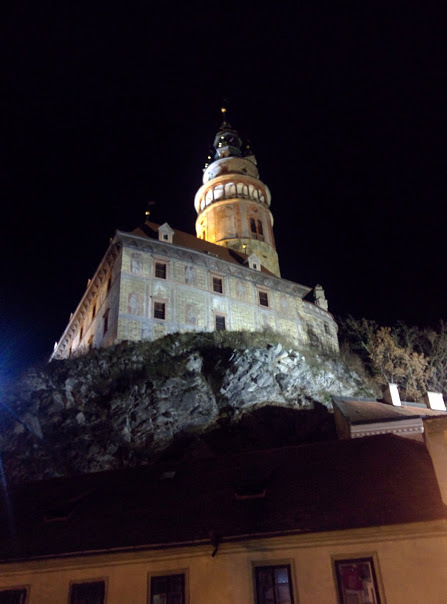 Despite this nasty cold that I am now fighting as I write this up, I am still in a haze of enchantment about Český Krumlov, the Czech people, and the fairy-tale-like forests and countryside. I’m with Simon Winder: I can really imagine living here quite happily.